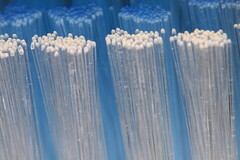 Fiber optic bundles. Photo by pasukaru76. Glenn Fleishman continues to dig into internet access issues at Publicola with another excellent article on municipal fiber and lessons learned from Lafayette, Louisiana. Reclaim the Media, the Northwest Media Action Grassroots Network, and the Hidmo Community Empowerment Project are cohosting a community meeting on fiber broadband on Wednesday, March 3rd, from 5:30 to 7:30pm at Garfield Community Center, 2323 East Cherry Street. Speakers will include: Malkia Cyril from Oakland’s Center for Media Justice, Tony Perez from the City of Seattle Department of Information Technology, local business owner Andre Helmstetter, Scott Durham from Central District News and David Irons of Broadstripe. Upgrade Technology for Underserved Neighbors (UTUN), a Southeast and Central Seattle neighbor group, has formed to advance internet access in our part of the city. They’ve met often with the City of Seattle and Broadstripe to work out a plan to improving service to residents in Beacon Hill, Judkins Park, Leschi, and the Central District. (500 30th Ave S) where they will be presenting an update to neighbors about their latest improvements. For more information and to keep up-to-date with UTUN activities, contact Tracy Bier via atbier@msn.com or 206-227-2369. Previously.